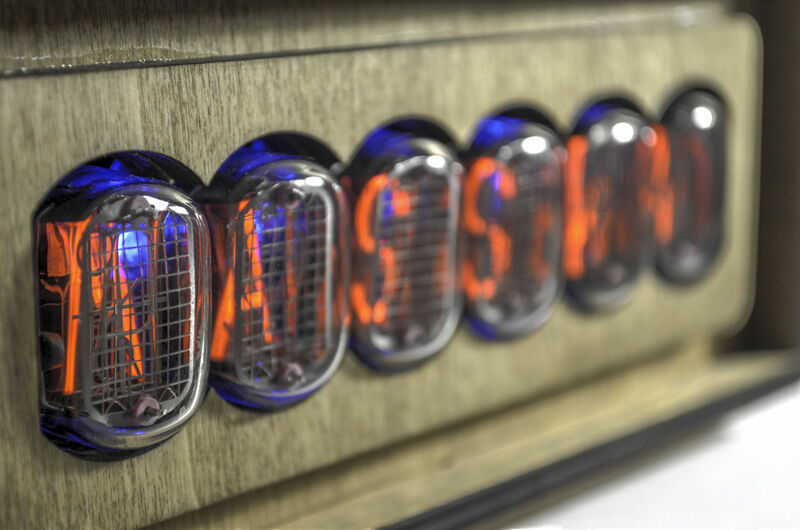 A client approached me to make a nixie clock and while perusing my website saw my Four Letter Word display using B-7971 nixie tubes. He asked if I could make one but have it saying his company name “Masska”. I let him know how expensive it would be to make and also a bit of a waste of the B-7971 tubes as since they are segmented tubes, they can display the full alphabet and numbers 0-9, but if made for this would only show a single word all the time. Knowing there were some nixie tubes with letters instead of numbers, I looked at the datasheets of the IN-19’s and IN-15’s and found that I could create the word with a combination of IN-15A and IN-15B tubes. The next thing was how to display the word. The easiest way was just to wire up the relevant cathode letter for each tube and turn on. It would work, a bit boring, easy to implement. The other option I thought was a custom clock chip that was modified to display a single “time” all the time and every minute display an animation to exercise the other letters in the tubes. This would look so much better and also give some longevity for the tubes. 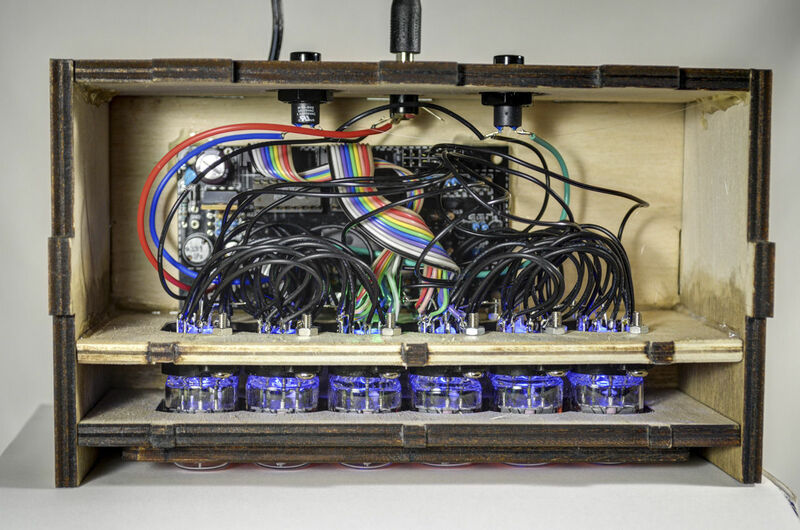 So I contacted Dave at unusual electronics, who I buy the programmed nixie chips from, asking if he was interested in doing this, if it was possible and how much it would cost! With a yes, yes and a cost back, I proposed this back to my client and he agreed to go ahead with it. The great thing about using the custom chip from unusual electronics meant I could use the same PCB as I do for the 6 digit nixie clock and wire up the tubes the same way as I usually do. So while Dave was working on the custom code, I started on the case design. 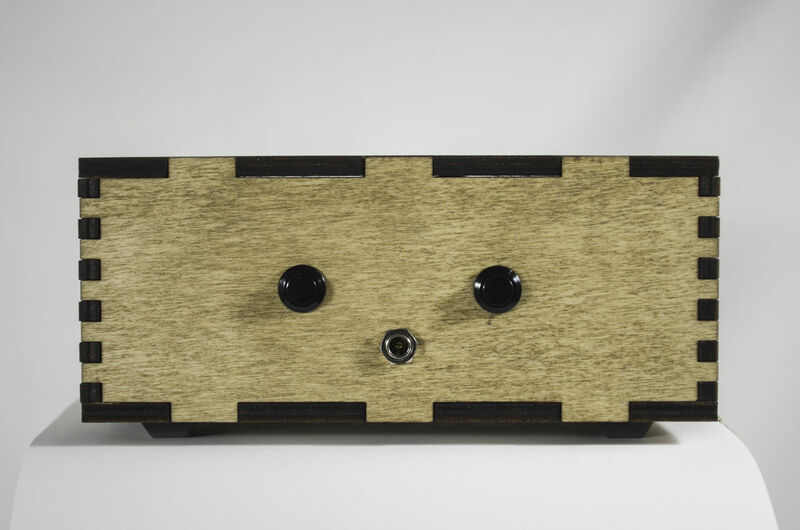 The client did not want an old multimeter meter as the case, just a basic wooden case. I was inspired by a laser cut case I saw on the internet, so I designed this base on the look of that. The tricky part was how to get all the case pieces to stay together without using screws. I created ridges on the two panels that would hold the tube sockets and the front panel and then cut out notches in the lid and base to line up with the ridges. This would hold them in place with a combination of PVA glue and hot glue. A couple of magnets in the lid and case hold to top down. I am really happy with how this turned out, Dave did a fantastic job on the programming and with a stain and oil on the case, it has come up alright as well. This has turned out to be an international project! 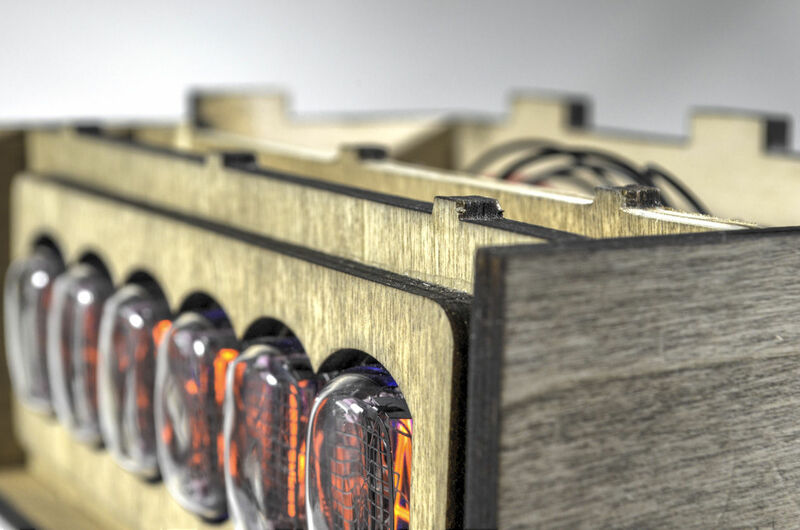 Nixie tubes are bought from Russia (manufactured in Ukraine), chips programmed and circuitry designed in the UK, case made in New Zealand and all assembled in Australia! See below a video of the effects that get displayed every minute. I have edited the video to just show the effects.